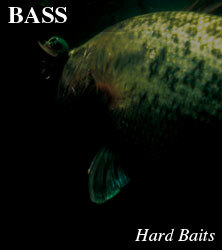 Bass' favourite bait fish are small smelt and shrimps. If you have eve had a bass bring up its last meal on your boat, then you may have been shocked by the small size of the bait they chase. Often they are eating bait that is a lot smaller than any lure you can throw effectively. That is where the FEINT BAIT series can give you the upper hand, and allow you to throw a high appeal, long distance, powerful lure with a visually small silhouette. KUWASE is a deep diving minnow with a tight roll. Not only does it have great action on a straight retrieve, it also responds quickly for appealing stop and go action in midwater situations. But most of all KUWASE works best when used with pump retrieves during cold water seasons, where fish typically stay away from large baits. Non stick bill is a new design lip. It is made thicker on the edges. This prevents the bill from digging into weed and soft bottom on contact.